This week's Tuesdays with Dorie (TWD) recipe was chosen by Lillian of Confectiona's Realm: Chocolate Oatmeal Almost-Candy Bars. 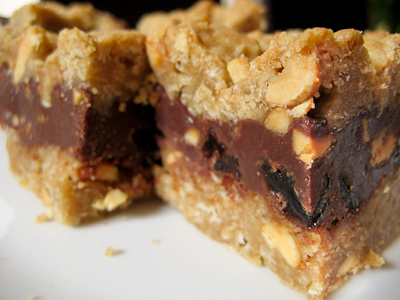 Take a fudgey chocolate layer filled with peanuts and raisins and sandwich it between an oatmeal and peanut layer and you've got Dorie's "Almost-Candy Bars." These were fairly simple to make, though it seems like every time we have a recipe that uses raisins, there's a huge debate amongst the TWD bakers about the inclusion/exclusion/substitution of raisins. I personally have no problem with raisins in my baked goods, and if you like raisinettes, I don't know why you wouldn't like other things that have both chocolate and raisins in them. So I went ahead and included the raisins in this recipe. Sometimes I'll substitute dried cranberries (craisins) for raisins in a recipe, but just to change things up a bit, not because I don't like raisins with my chocolate! To be honest, I did not really taste the raisins in this recipe. They're there and add a nice flavor but I'm not sure anyone who tried them could really tell that there were raisins in these. I enjoyed them quite a bit - to me, they tasted like a chocolate peanut butter oatmeal raisin cookie bar more than anything else. Personally, I think the "almost-candy bar" part is a bit of a misnomer. The Snickery Squares are more candy bar-like than these. Regardless of what you call them, they make a great snack. Thanks, Lillian, for hosting this week. If you would like the recipe, you can find it here. 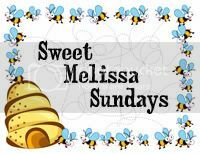 Make sure you check out the TWD Blogroll, to see how everyone else enjoyed these sweet treats! - This recipe makes a lot of bars, so consider halving the recipe if you don't have friends or coworkers to share these with. - The topping does not spread much in the oven, so what you see is what you get after you add the topping. - Wrapped well, these will keep for about four days at room temperature, 1 week in the refrigerator, or up to two months in the freezer. Your bars look fantastic Jaime. I only left out the raisins so my guys would eat them. I used pecans and caramel instead. Yours look excellent! We really liked these. i don't understand why raisins raise so many hackles either--they're just chewy little bursts of sweetness! meh. i love your bars, jaime--they look perfect. Perfect bars Jamie. I agree that you don't even know the rasisn are there. I thought they tasted like peanut butter, too! Whatever they were, they were totally delicious though and yours look great! 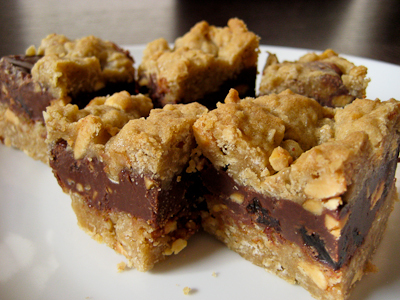 Very delicious looking bars! I went the cranberry route, and thought the dried fruit really added nice flavor and texture. Ok - these are amazing!!! I saw the recipe and went directly to the kitchen and baked these yummy treats. I loved them, hubby loved them, and the kids --- devoured them! I love the raisin and chocolate combination so I never quite understand what all the fuss is about, but I guess to each his own, right? 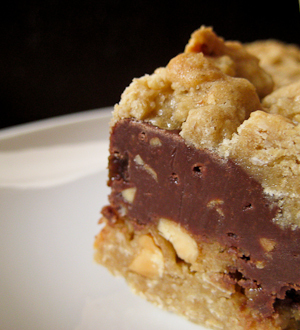 Your bars look wonderful and kudos to you for all the baking you've been doing since your baby was born! Oh. My. Goodness. So glad I found your blog- these look unbelievable!! I really do need to make these. This makes my mouth water just looking at the photos. Note: must make !